Tarco is pleased to present online its series of roofer’s reports. A Tarco Roofer’s Report describes the activities of a professional roofing contractor with regard to one or more of Tarco’s products. Typically, the report details a roofing application in which a product provides cost and labor savings while improving quality. Columbia Roofing Provides Extra Protection with LeakBarrier Ice and Water Armor - Ice Dams? Not a Problem! For several months, hurricane mitigation legislation mandated the use of self-adhering underlayment on residences in Florida. Although these requirements were eventully relaxed, many contractors and consultants continue to specify a secondary water barrier. 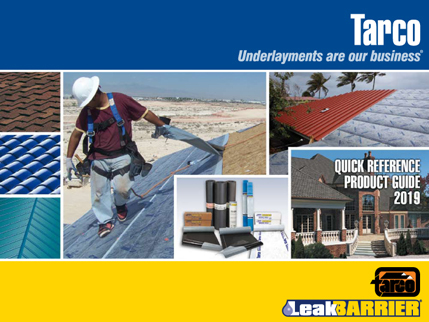 In this special 4-page Roofer's Report, Tarco recounts the experiences of six roofing professionals in Florida with self-adhering underlayment and their recommendations for the rest of the country with regard to the installation of secondary water barriers.